You might think that it's the sweet potato that makes this recipe, but it isn't. It's the corn. Also roasting leeks makes the house smell amazing. Scrub and dice the sweet potato. Trim the leeks, discarding the dark green parts. Halve the white and light green parts lengthwise, wash thoroughly, and slice crosswise. 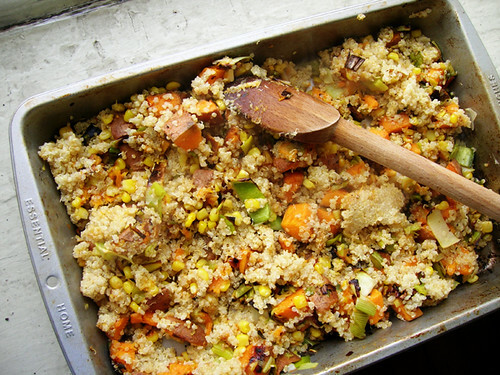 Toss the sweet potato, leeks, and corn in a baking pan with olive oil, salt, and pepper. Roast until nicely browned, about twenty minutes or maybe longer because of the corn giving off liquid.